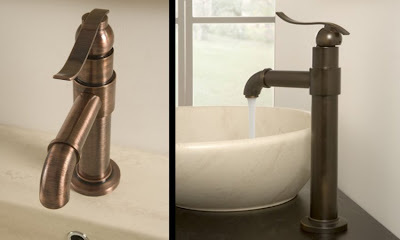 In case you missed it, that Bali faucet by Graff is a knock out, It's been haunting me and here's why. 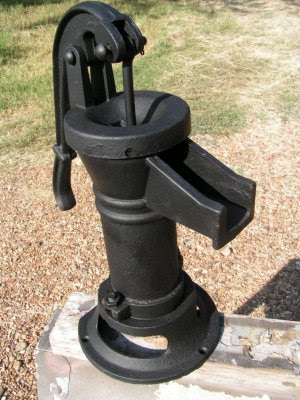 When I was a kid, my family had a rather rustic cottage in rural Ontario and we had one of these as a ktichen faucet. Here's Graff's modern take on that same idea. I'm astounded! It really reminds me of the outdoor pumps at the farms of relatives as a little girl! very cool! It takes me right back too Karena. Right back. Paul you should take a look at the Delta Victorian open channel.... reminds me of that pump as well. The Vesi? I didn't know Delta had a Channel version of the Victorian. And yes, it was an is in Ontario, Canada. My brothers and their families still go up there every summer. The place is outside of a small town called Tamworth and it's about an hour-and-a-half north of Kingston. It's about midway between Ottawa and Toronto. We had a handpump at the kitchen sink and it brought in lake water for cleaning and washing. Drinking water came from another, larger handpump about 100 meters down a path through the woods. One of our daily chores was to carry buckets of drinking water into the cottage. Looking back, it was a great experience. However, there are few things more irritating than having your hands busy with a pump when the deer flies find you. Hah! Regarding the deer (black or horse) flies. Most Hunters and Loggers will tell you; about a week prior to exposure taking a daily dosage of a Vitamin E supplement will repell them. Really? I never heard that about Vitamin E. We used to rely on Muskol, but sometimes even that didn't work. YES Paul, I can attest to it. It actually works! When we were kids, prior to going to the cottage (on the advice of my Granfather who was a Pharmacist) it was a ritual that we take it. I'm not even sure Muskol was around then. Also know first hand from an owner of a Forestry business in Northern Ontario, he ensures his staff takes it. Hmm. I have a bunch of nephews and brothers heading up your way in a couple of months. I'll pass along your remedy.